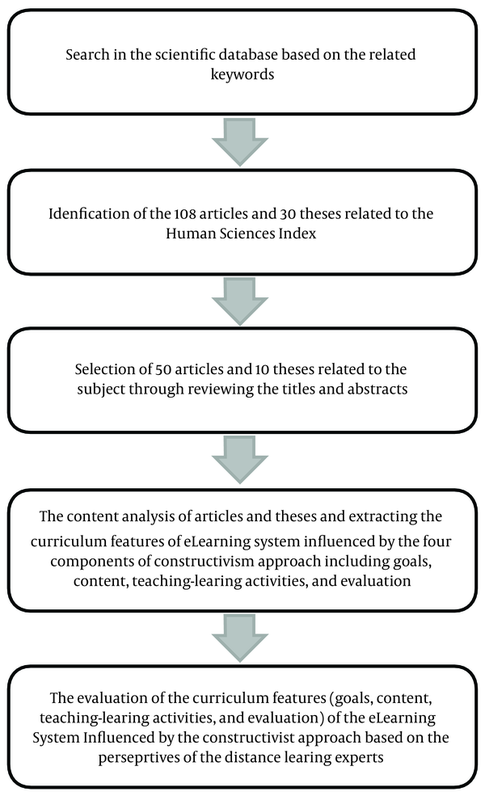 To Cite: Dastanpour T, Karamalian H, Sarmadi M R. The Explanation of the Curriculum Characteristics of the E-Learning System Based on the Proposed Principles of Constructivist Approach, Interdiscip J Virtual Learn Med Sci. 2017 ; 8(4):e15088. doi: 10.5812/ijvlms.15088. Context: The present study was conducted to explain the curriculum characteristics (including, goal, content, teaching-learning strategies, and evaluation) of the e-learning system based on principles of the constructivist approach. Results: According to the epistemological principles of constructivist approach, the nature of subjective knowledge, cognitive practices, such as discussions, conversations, and personal mental representations, are symbols, and there are no independent-of-mind facts. Conclusions: Educational goals are employed to strengthen communication skills, negotiation, decision-making, problem-solving, and critical-thinking. The instructors’ duties are not to present facts but to create grounds for thought. The goals are determined through the negotiation process between the instructor and learners. The content features the reliance on selection and adaptation of diverse contents with learners with the problem-based approach. In the eLearning system, however, the evaluation is evolutionary and qualitative. In every society, education depends on educational perspective and approach towards it, influenced by a dominant social philosophy of the society. This dominant social philosophy appoints the views and visions of epistemology. Epistemological attitudes generally answer questions, such as “what is knowledge?”, “how is it acquired?”, and “what are the knowledge resources?”. Epistemological attitudes specifically explain educational dimensions, such as the nature of knowledge, learning, content, and approach towards education (1). However, various approaches exist in the nature of educational contexts. This variation comes from different attitudes towards the nature and the way of acquiring knowledge. This diversity of attitudes in the learning of different fields is beholden to the variance in epistemological and philosophical approaches. According to Knoblauch, epistemology is the main key to select educational and training methods, it is the core to identify, differentiate, and distinguish the effective action and application of these methods (2). Since learning deals with epistemology, it is the main focus of learning theories. Epistemological perspectives impact all educational-system approaches, including the e-learning educational system. The impacts of epistemology on the e-learning system are considered through the curriculum. However, the education system in the modern world is faced with three signs of progress, in which each influences important elements of the educational system, such as instructors, learners, goals, contents, and teaching-learning strategies when the generation of open and distance education is established. The curriculum based on the behaviorist psychology or transitional approach (1900 to 1950). The curriculum based on the epistemological psychology or process approach (1960 to 1980). The curriculum based on the constructivist psychology or interactive approach (1990 until now). The third generation of open and distance education, the e-learning system, is accompanied by a relativist approach to epistemology. This approach has affected many educational theoreticians. Adopting the fundamental epistemological principles with constructivist psychology, the theoreticians often emphasize on this approach in their curriculums (3). When the constructivist approach is practiced in the educational cycle, the questions of “how would be the main elements of education will be influenced based on the approach?” will arise. One of the main elements is the curriculum, since it has the main role in the e-learning system. Being at the heart of any educational system, the constituent elements of the curriculum are enormous, as many as researchers. These researchers all believe that their elements should be considered in all curriculums. For example, Tyler (4) expressed that four elements should be included in all curriculums, including identifying goals, selecting contents, organizing experiences, and evaluating effectiveness. In addition, based on the need assessment, Taba and Spalding (5) found that setting goals, selecting content, organizing content, choosing learning activities, organizing learning activities, and evaluating effectiveness are important elements of the curriculum. However, in line with Tayler, some other researchers summarized these elements to four main elements, such as goal, content, performance, and evaluation of the curriculum and these elements are recognized and practiced in the curriculum cycle (6). The third generation of open and distance education, the e-learning educational system, is accompanied by a relativist approach to epistemology. This approach has affected many educational theoreticians. According to the adaptation of fundamental epistemological principles with the constructivist psychology, theoreticians often emphasize on the relativist approach in their curriculum (3). What are the dominant epistemological principles, constructivism, in the e-learning system? What are the characteristics of the goals in the curriculum of eLearning system, based on the proposed principles of the constructivist approach? What are the characteristics of the content in the curriculum of eLearning system, based on the proposed principles of the constructivist approach? What are the characteristics of the teaching-learning strategies in the curriculum of eLearning system, based on the proposed principles of the constructivist approach? What are the characteristics of the evaluation in the curriculum of eLearning system, based on the proposed principles of the constructivist approach? The current study used the document-analysis method. The analytical codes were extracted from the main components of the curriculum in the constructivist approach presented by international and, subsequently, Iranian eLearning theories. In this research, qualitative content analysis was applied using a deductive method. Prior to conducting the research, the researcher, by assuming and presenting the specific definitions, examined specific texts and compared the pre-determined definitions. Then, the analyzed texts were judged by the extension or non-extension of the definitions in the text. The discussion and conclusion about the research questions was done, after analyzing the research codes and establishing a relationship between the codes. Furthermore, 30 faculty members of the field of distance learning evaluated the validity of the research findings and confirmed the validity. The note-taking method, using the wave-like reading technique, was used as the data collection tool. In this technique, after reading several resources, the researcher wrote the theoretical implications and the thoughts about them (7). Figure 1 demonstrates the steps of the research process. The study population consisted of all articles and theses related to the research subject in scientific databases (including EBSCO, NOORMAGS, MAGIRAN, SID, GIGALIB, and IRANDOC). In the document-analysis method, the sampling was “purposive-theoretical” method, by which the researcher selected resources based on the research objectives. Using the method in the first part of the research, 108 articles and 30 articles related to Human Science Index and 50 articles and 10 theses related to the study subject were drawn by reading the titles and abstracts. In the second part of the study, snow-ball sampling as one of the systematic sampling methods that is commonly used in qualitative research, was applied to evaluate the findings of the research by specialists in the field of distance learning. In addition, in order to find the best sample, knowledgeable individuals were consulted, who the researchers about suitable study subjects. According to the history of epistemological philosophy, the understanding of knowledge moves from a static and inactive view towards an active and flexible view. Early theories stressed knowledge as awareness of identified elements that are independent of any observer. According to this objectivist approach, the identified elements have an innate concept, and knowledge is a reflection of the reality adaptation. In contrast, the relativist approach, as the philosophy of the fundamental e-learning system, relies on the notion that reality does not have absolute and objective values or, at least, a man has no way to know reality. According to the relativist approach, humans do not have direct access to realities. Instead, they only mediate the construction between facts and realities. Unlike objectivists, who believe in reality as an independent and out-of-mind entity, the relativists recognize reality with psychological aspects that individuals perceive. According to relativists, the subjective criterion of reality is not the adaptation of the subjective reality with objective reality, but rather reality is a relative matter. The last claim of relativists, however, is that exterior knowledge about the world does not exist, and knowledge is subjectively constructed. According to their opinions, since knowledge continuously changes within cultures and societies, and creates different definitions, it is casual and dynamic. Constructivism is the antithesis of behaviorism and cognitivism. These approaches are based on realistic philosophy. Realists believe that reality exists out of mind, and the goal of education is to transfer construction of reality to the learners’ mind. However, constructivists define learning as the creation of concepts of experience. Unlike behaviorists and cognitivists, constructivists do not define knowledge as an independent phenomenon from the mind. However, although they do not deny the out-of-mind world, they believe individual’s knowledge of the world based on interpretative results of individual’s experience. From constructivists’ point of view, the world of individuals is created in the mind and the world of an individual is not more realistic than the other one. Therefore, concepts are created, not reproduced. However, since concepts vary as much as individuals, they are not acquired. As a result, the acquirement of a concept, which is created before, is impossible, because knowledge representation in individual’s mind changes continuously. The strategies and methods of the constructivist approach are to focus on helping learners examine complex situations and subjects as a specialist. Therefore, learners are asked to construct self-perception of a subject through their own interpretations. In this approach, the content is not previously assigned and seeking different resources is accentuated if information could be applied to various contexts, the methods that promote the multi-contextual learning should be applied. Thus, learning shifts from the one-way instructor-learner method to the constructive and heuristic knowledge method. Constructivism helps learners to construct new concepts by applying information and knowledge. In this approach, educational designers rely on newly found educational technologies, and instructors and learners have a transactional relationship in order to build knowledge. Constructivism emphasizes on personal experience and learning is developed by implementation at the best level. Constructivist theories challenge the traditional approach of teacher-orientated or teacher-spoken classrooms, and stress on knowledge building and mental models. From constructivists’ point of view, learning occurs through presence and corporative activities in groups. Thus, e-learning provides learners with the possibility of presence in social networks and with a suitable environment for the implementation of this learning approach. Table 1 demonstrates the proposed principles of constructivism in relation to knowledge and learning. In this part, according to the proposed principles of constructivism, four elements of the curriculum in the e-learning system are explained (e.g., goals content, teaching-learning strategy, and evaluation). Goals: Setting educational goals is the most important element in the e-learning system curriculum. According to constructivism and relativism, as Holmes noted, the goal is to prepare the learner to build and to produce knowledge as well as to develop and provide deep learning with insight and understanding. In addition, the most important goals of learning are to develop problem-solving (active knowledge seeking through different activities to discover solutions, concepts, principles and roles), argument, critical thinking, and self-paced learning skills, fostering the ability to think independently. In brief, the main aim of e-learning curriculum is to nurture the individuals, who are actively able to solve problems. However, in this approach, emphasis on memory alone does not play an important role, yet this approach emphasizes on insight and reflection. Content: The second element of the curriculum in the e-learning system is to select and organize the content. Content defines a set of organized knowledge, facts, concepts, principles, methods, generalizations, attitudes, and research methods related to a subject. The content of the e-learning curriculum has to be based on criteria, including being deep, rich, and specialized, as well as leaner-, and problem-oriented. Thus, facts, concepts, and principles should be organized based on multimedia and hypermedia technologies that lead to deep understanding, learning motivation, and knowledge building. Therefore, in the e-learning system, it is not possible to provide the same content for all learners, and instead provides learners with various contents matched with their abilities and learning style based on the learner and problem orientations of the e-learning system. In fact, the content is not predetermined, the focus is on the access to various sources. In addition, the content of the curriculum should be arranged through the participation of learners. Moreover, the curriculum content should provide learners with the opportunity of social interactions, as an inseparable part of learning. For example, in problem-solving, learning in the form of a social group, perceiving other’s views, and defending a self-view are important and should be reflected. Teaching strategy in the e-learning system: Teaching strategies are activities, by which an instructor persuades learners towards educational goals in the smallest unit of time. However, learning strategies are activities, by which learners achieve educational goals of the eLearning curriculum. In the constructivist approach, unlike behaviorism, the goal of teaching is not to change learners’ behaviors, and it is to promote class activities and interactions between learners and teachers. In the constructivist approach, teaching does not start by presenting facts, and it creates opportunities for learners to think independently. Thus, one of the requirements of this method of teaching is “the instructor’s belief in the learners’ ability to think”. Therefore, the instructor’s duty is not to present facts, and instead is the creation of opportunities for learners to think, independently. During the teaching process, thinking is the main point that the instructor should promote among learners. Instructors often apply the problem-solving method and cooperative learning as teaching strategies, in which learners have the chance to compare their experiences with other classmates. Thus, one of the main characteristics of the constructivist approach is learning in form of a cooperative group. In the e-learning system, teaching is affected by the constructivist and relativist approaches, through super visional actions and directional activities, providing feedback, participating in discussions, and instilling motivation. In this educational setting, the instructor plays the role of a facilitator or e-mediator and seldom represents the information. In summary, it can be stated that e-learning settings are activity-oriented environments, where the learners construct their knowledge through various activities. The role of instructors is the facilitator of discussion, advisor, appraiser, and consultant. 4. Evaluation: The changes in the evaluation system in order to improve the learner’s learning status is the phenomenon that is practiced in the majority of countries. This phenomenon can be described by two related roots. First, a new approach in educational psychology, such as constructivist and cognitivist approaches. Second, a movement of the educational reform and changes in curriculum, an international comparison in the various curriculum subjects, and a demand for the increment of educational standards. Overall, constructivists stress on evolutionary evaluation, compared to other evaluation systems. Scriven coined was the term of evolutionary evaluation in the curriculum for the first time. Evolutionary evaluation is not only valuable for setting the curriculum and is also useful for teaching and educating learners as the attention to constructivist views change. Classroom evaluation is used as a tool to improve the learning process and, consequently, it is increasingly emphasized. Accordingly, the evolutionary evaluation has a critical role and is deemed as an important factor. Nevertheless, constructivists, instead of evaluating the goodness or badness of learners’ performance, consider how much and what kind of help learners need to be successful. In other words, the constructivist approach seeks for removing rankings and standardized tests and tries to involve evaluation as part of the learning process, in which learners play a bigger role in the evaluation of their own development. As Sanders noted “evaluation is one of inseparable steps of constructivist education, which is involved in the educational process, rather than presented at the end of a course”. Goals To build and produce knowledge and to create deep learning with understanding and insight. To develop problem-solving skills, argument skills, critical thinking skills, and self–paced learning (independent thought). To strengthen discussion and participation skills. Content Emphasis on various contents. Selection and organization of contents with learners’ contribution. Usage of the multimedia principles. Being deep, rich, and specialized. Teaching- Learning Methods Instructors do not represent facts. However, they provide learners with context to think independently. Instructor is a facilitator or e-mediator and seldom represent facts. The course goals are determined by learners in negotiation with instructors. Learners have a significant role in reforming and controlling the education. Learning setting, skills, contents, and homework are realistic and authentic. Emphasis is on the knowledge building, not reproducing. Learners build knowledge by participating in various activities. Emphasis on promoting the learners’ sense of curiosity. Evaluation Qualitative and evolutionary evaluation. Classroom evaluation as a tool to improve the learning process. Removing the rankings and standardized tests. Evaluation become a part of the learning process. Using various methods for the evaluation by self- and peer-assessment. As the results illustrate, the relativist approach is one of the fundamental philosophies in the e-learning system, derived from the epistemological principle. Unlike the realists, the relativists do not pay attention to the existence or non-existence of the out-of-mind world, yet emphasize on social and cognitive realities, as a human perception of the world. Thus, dissimilar to realists, who consider that reality has an entity independent from the mind, relativists believe that reality has a psychological aspect, which is based on the individual’s perception. However, in the relativist approach, the main criterion of reality is a relative matter, not a mental adaptation with objective reality. Similarly Glasersfeld (8), Remhof (9), and Boghossian (10) reported the same results. However, constructivism believes that learners build knowledge and learners create the concepts through experience. In contrast to behaviorism and cognitivism, they consider knowledge as a concept independent of the individuals’ mind. Although they do not deny the out-of-mind world, they believe that knowledge is derived from individuals’ interpretation of experience. Therefore, in their opinion, concepts are created, not acquired, since these concepts can be differently created from person to person. Similarly, Boghossian (10), Komperda (11) and Martinez (12) found consistent results. Achieving a correct concept that is previously established is not possible, and knowledge representation in individuals’ mind is constantly changing. The constructivist methods in the e-learning system are based on helping learners examine complicated subjects and situations and create a specific opinion in a special context, similar to an expert. Thus, the learner is asked to develop a self-perception of a subject by social interactions and to use different resources without paying attention to any previous content. Similarly, Nelson (13) and Kharrazi (14) reported the same results. The most important goals of learning are to develop problem-solving skills, argument skills, critical-thinking skills, and self-paced learning that are to enhance the ability to think independently. The study findings are in line with the research of Kharrazi and Kareshki (14), Fox (17), Holmes (16), and Buchanan (18). The main characteristics of content are to be deep, rich, and specialized as well as learner- and problem–oriented. It is important to note that the content principles (e.g., multimedia, psychical proximity, coherence, presentation quality, redundancy, and personalization), improve the quality of the curriculum in e-learning and help learners with better understanding of the content. Similarly, Driscoll (19), Light and Cox (20), Eitel (21), Seraji and Attaran (15), and Remhof (9) reported the same results. Regarding the learning strategies in the e-learning system, instructors’ duty is not to represent the given facts and instead provides learners with the opportunity of thinking. Instructors in an educational setting have the role of a facilitator and e-mediator and seldom present information. Learning is acquired through participation, and learning has a fundamental role in reforming and controlling learning. Similarly, Seraji and Attaran (15), Fox and Helford (17), Komperda (11), Duffy (22), Holmes and Gardner (16) found consistent results. Regarding the evaluation, it is a qualitative and evolutionary process. Classroom assessment is a tool for improving the learning process. Rankings and standardized tests are removed. Thus, evaluation becomes a part of the learning process and, in evaluation, various strategies, including self-evaluation and peer-evaluation are used. The findings of the study were analyzed by Buchanan (18), Seraji and Attaran (15), Scriven (23), and Duffy (22). In summary, it can be implicated that the e-learning system creates a new paradigm in the educational system. E-learning has a fundamental role in creating a social-interaction-oriented setting that is at the center of constructivist theories, concentrating on active learners. The current research findings are consistent with several studies (24, 25). Table 2 demonstrates the constructivist characteristics of elements of the curriculum in e-learning. Authors’ Contribution: Study concept, design and critical revision of the manuscript for important intellectual content was developed by the authors, who participated in the overall process. 1. Stoller A. Knowing and Learning as Creative Action: A Reexamination of the Epistemological Foundations of Education. US: Palgrave Macmillan; 2014. 2. Knoblauch H. Communicative constructivism and mediatization. Communicat Theor. 2013;23(3):297-315. 3. Remhof J. Defending Nietzsche's Constructivism about Objects. Europ J Philosoph. 2017;25(2). 4. Tyler RW. Basic principles of curriculum and instruction. The US: University of Chicago press; 2013. 5. Taba H, Spalding WB. Curriculum development: Theory and practice. New York: Harcourt, Brace & World New York; 1962. 6. Olivia P. Developing the Curriculum (6 Ed.). New York: Pearson Education Publication; 2005. 7. Bhattacherjee A. Social ScienceResearch: Principles, Methods, and Practices. Create Space Independent Publishing Platform; 2012. p.102 p.
8. Von Glasersfeld E. An exposition of constructivism: Why some like it radical. Facet System Scie Spring. 1991:229-38. 9. Remhof J. Defending Nietzsche's Constructivism about Objects. Europ J Philosoph. 2017;25(2). 10. Boghossian P. Fear of knowledge: Against relativism and constructivism. Oxford: Clarendon Press; 2007. 9 p.
11. Komperda R. Deconstructing constructivism: Modeling causal relationships among constructivist learning environment factors and student outcomes in introductory chemistry School of Arts and Sciences. Catholic Univ America. 2016. 12. Martínez‐Delgado A. Radical constructivism: Between realism and solipsism. Scie Educat. 2002;86(6):840-55. 13. Nelson AF. Constructivist Instructional Practices and Teacher Beliefs Related to Secondary Science. Teach Learn Colleg Saint Elizabeth. 2017. 14. Kharrazi A, Kareshki H. Self-regulated learning: the role of environmental perceptions and motivational beliefs. Psychol Rep. 2010;107(1):303-17. doi: 10.2466/01.11.14.20.PR0.107.4.303-317. [PubMed: 20923075]. 15. Seraji F, Attaran M, Nadery E, AliAsgari M. Virtual University curriculum design. J Curricul Stud. 2007;2(5). 16. Holmes B, Gardner J. E-Learning: Concepts and Practice. London: Stage Publication; 2006. 17. Fox M, Helford P. Advancing the boundaries of higher education in Arizona using the World Wide Web. Interactiv Learn Environ. 1999;7(2-3):155-74. 18. Buchanan AE. Online Assessment in Higher Education: Strategies to Systematically Evaluation Student Learning. In: Howard C, Schenk K, Disceza R, editors. Distance Learning and University Effectiveness: Changing Educational Paradims for Online Learning. London: Information Science; 2004. 19. Driscoll M. Psychology of Learning for instruction. Boston: Allyn & Bacon; 2000. 20. Light G, Cox R. Learning and Teaching in Higher Education. London: Paul Chapman Publication; 2002. 21. Eitel A. How repeated studying and testing affects multimedia learning: Evidence for adaptation to task demands. Learn Instruct. 2016;41:70-84. 22. Duffy TM, Jonassen DH. Constructivism and the technology of instruction: A conversation. Routledge; 2013. 23. Scriven M. The methodology of evaluation (Perspectives of Curriculum Evaluation, and AERA monograph Series on Curriculum Evaluation, No. 1). Chicago: Rand NcNally. 1967;4(5):422-5. [PubMed: 6076845]. 24. Osorio Gómez LA, Duart JM. A hybrid approach to university subject learning activities. British J Educat Technol. 2012;43(2):259-71. 25. Saif AA. Modern educational psychology: psychology of learning and teaching. Tehran: Doran; 2013.